If you’re buried under a pile of bills, with creditors calling you day and night, it’s time to do something about your debt. But what? What are your options? There are a number of possibilities that you can choose. We’ve explained some of these options below. Talking with your creditors can seem daunting, but it could help. Your creditors might be willing to create a modified payment plan with you. This option works better the sooner you reach out to your creditors: if you wait too long, your creditors might begin the process of garnishing your wages or taking you to court for the debt. If you go to them with an explanation of your problems and a plan to fix them early on, they are often more likely to be understanding. These services work with you and your creditors to help you develop a debt repayment plan. The service requires you to deposit money with them, then they pay your creditors. Some credit counseling services are nonprofit and legitimate, and they charge next to nothing or nothing at all to use their services. But, many “credit counseling” companies make their money by taking a piece off the top of what they negotiate with your creditors. That’s right, they make their money directly from your creditor payments. 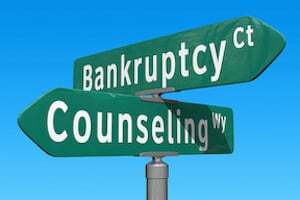 More importantly, many of these credit counseling companies will never talk to you about your bankruptcy options. Why not? Because, like your creditors, they make nothing when you file for bankruptcy. Most importantly, these credit consolidation companies prey on your good nature and desire to pay back your bills. They neglect to tell you how harmful their services are to your future credit rating. In many cases, it is far better for you to simply discharge your debts in a bankruptcy than try to pay down your bills over time. With this latter approach, your credit scores remain in the dumps for years and years. This is because the credit card companies and other creditors continue to report your payments as late and delinquent for years. In many cases, it is simply better to file for bankruptcy and then start building your credit again immediately. Many of our Washington State bankruptcy clients are able to build their credit scores back up to respectable levels within two or three years of filing. Debt consolidation involves reorganizing your debt into one more manageable payment. You can consolidate your debt through either a secure or unsecure loan. A secure loan requires you to put your home, car, or other property as collateral. If you fail to make the loan payments, the creditor can repossess the collateral. An unsecure loan, on the other hand, doesn’t require any collateral. However, because this type of loan is riskier for creditors, the interest rate is often higher. Depending on the type of bankruptcy that you qualify for, you can wipe out eligible debts (such as credit card debt and medical bills) or create a repayment plan that may reduce the amount of debt you owe. Bankruptcy has a negative effect on your credit score, which means that you should think carefully before filing. If you can solve your problems using an alternative to bankruptcy, you should do so. However, if you have a significant amount of debt, bankruptcy may be the best option for you. The explanations above are brief, and you may still have questions about what you should do to solve your financial problems. Feel free to contact the experienced Tacoma, WA bankruptcy lawyers at the Law Offices of Jason S. Newcombe. We’d be happy to discuss your situation and help you determine which option is right for you.